With trips, screenings and discounts, we treat seniors twice as nice. At Marshall Medical Centers, we believe seniors deserve special treatment. That's why we've developed GoldCare 55+, a program created to allow people 55 or older to get the most out of life. GoldCare 55+ reaches out to area seniors by promoting a healthy and independent lifestyle. Members benefit from free health screenings, discounts on wellness events, better access to Marshall Medical Center services and much more. If you are 55 or older and would like to enjoy all the benefits our GoldCare 55+ program has to offer, download the application below and mail it back to us. If you have any questions, please call us at (256) 571-8025 (for Arab area residents: (256) 753-8025). 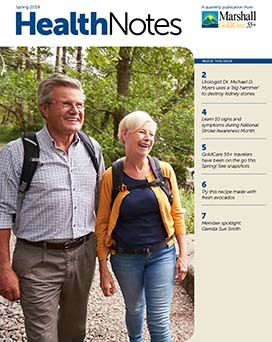 A quarterly newsletter specifically for GoldCare55+ members. 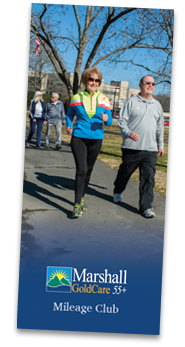 The GoldCare55+ Mileage Club is designed to encourage and reward consistent moderate exercise by GoldCare55+ members. 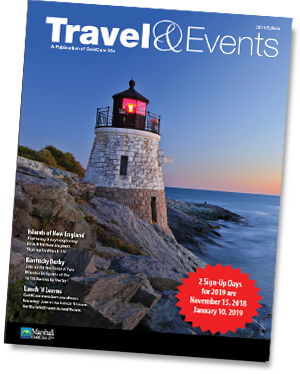 This brochure contains all the trip information for 2019 as well as the Lunch and Learn schedule.